Historical and statistical soccer stories from all over the world, old and a bit older. 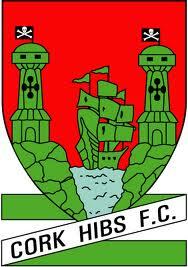 Cork Hibernians played nineteen seasons in the League of Ireland, from 1957 until 1976. One time they were crowned league champion, back in 1971. Player-manager Dave Bacuzzi and Miah Dennehy were their main assets to clinch that title. Soccer in Cork has a turbulent and somewhat confusing history. In 1957 Cork Hibernians replaced Cork Athletic in the League of Ireland. Before that Cork was represented in the League of Ireland as Fordsons (1924-1929), Cork FC (1930-1938) and Cork City (1938-1940) - all the same club. Then Cork United (1940-1948) replaced Cork City that went bust in February 1940. Cork United was very successful, winning the league in 1941, 1942, 1943 and 1945. Cork United folded in 1948, lack of money got in their way. With much of the same players a new club, Cork Athletic, was founded and replaced United in the League of Ireland. They also had magical moments, taking the title in 1950 and 1951. So Cork Hibernians (previously an amateur club) had big shoes to fill in 1957, when Cork Athletic resigned from the league because of - there it is again - financial trouble. In a league with twelve clubs, Hibs at first didn’t perform up to expectations. In their first season they suffered a record defeat (2-8 against Dundalk) and came in last, without being relegated. After that, a fourth place in 1964-65 was their best result. During that season Cork Hibernians did score the most goals in the league (41), with Jack Fitzgerald (9 goals), John McCole (8) and Donie Wallace (8) getting the headlines. From 1968-69 onwards Cork Hibernians claimed a place at the top of the league. In that season they were third, a feat they repeated in 1969-70. Hibs had a talented team, with players like John Herrick (born in 1947), Englishman Tony Marshden (1948), Miah Dennehy (1950) and David Wigginton (1950). Attendances at their homeground Flower Lodge rose, more than 10,000 was quite normal. At the end of the 1970-season, the board assigned 30-year old former Arsenal and Manchester City player Dave Bacuzzi as playermanager. He instantly struck gold. Led by Bacuzzi and goalkeeper Joe O’Grady, Cork Hibernian had the best defense by far. Their 38 goals were scored by Dave Wigginton (8), Carl Davenport (8), Tony Marshden (6), Donie Wallace (5), John Lawson (3), Miah Dennehy (2), Walter ‘Sonny’ Sweeney (2), John Herrick (1) and Jim Murphy (1). Two goals were scored by opponents. On goal difference Hibernians would have won the league, but the Irish Association decided there should be a Championship Play Off. On April 25, Cork Hibernians met Shamrock Rovers at Dalymount Park, the home of Bohemian Dublin. A crowd of 28,000 people saw Miah Dennehy opening the score for Hibs with a shot from eight yards. Mick Leech equalized for Rovers in the second half. After a John Lawson corner, Miah Dennehy scored his second. Dennehy also provided the third, running past two Rovers-defenders, with Dave Wigginton needing two attempts to beat Shamrock-goalkeeper Pat Dunne. So Cork Hibernians were champions of Ireland, and as a reward, they were to play Borussia Mönchengladbach in the European Champions Cup. They’d already played Valencia (0-3 and 1-3) in 1970 in the Fairs Cup, but the Germans, with Günter Netzer and Jupp Heynckes in blended form, were a far better opponent. Hibs lost 5-0 at home on September 15, 1971, two weeks later it ended 2-1 in favour of the Germans. In the domestic league of 1971-72 Cork Hibernians came in second, four points behind Waterford. Hibs had their revanche in the FAI Cup-final. On that day, Waterford was no match for Miah Dennehy, who scored all three goals (the first hattrick in Cuphistory, started in 1922) in a 3-0 victory. 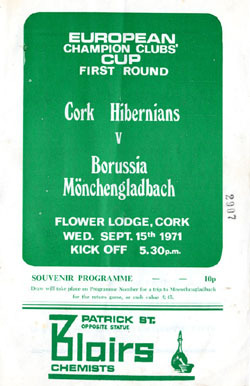 After that, Cork Hibernian stayed a top five team, until things got wrong in 1976. Since the early seventies, the people in Ireland could watch English matches from the First Division on the tv. It crashed attendances at home, causing financial catastrophy. On top of that, Hibs made the very unwise decision to engage Rodney Marsh, who was far too expensive. One thing led to another, and Cork Hibernian withdraw from the league in 1977. - Munster Senior Cup, 1961, 1965, 1968, 1969, 1970, 1971, 1973 and 1975. I was at that match also. Di Stefano was the manager that evening. It was the beginning of a glorious era for soccer in Cork. Bacuzzi’s arrival changed everything. In his first season, Hibs won the league. Then the cup two years running. In ‘72, they were running neck and neck with Waterford in the league and in the last game of the season both sides met at Flower Lodge. I’d never seen a crowd like it at The Lodge, 26,000 was recorded, we were packed in, and when John Lawson put us one up inside 2 minutes, the place erupted. Waterford had a few injuries and back in the day only one sub was allowed. Hibs scored again befor half time, and Waterford were down to ten men through injury. We were cruising. 11 minutes from the end, Carl Humphries, a cork man, pulled one back for Waterford and you could see the unease in the Hibs back line. A dodgy pen and a Alfie Hale goal settled it. However, Hibs beat the 3-0 the following week to win the FAI Cup. The cup was won again the following year, then Bacuzzi was sacked and the club folded. The funny thing about this is I have travelled a bit since and once I tell people I’m from Cork, it’s amazing the amount of people who remember Cork Hibs. One particular guy From Kilkenny, I met in New York told he himself and his buddies would follow Hibs all over the country, and said there were plenty more like him who would make a trip to Ballyboufey on a snowy Sunday in January. Their appeal was magic, but like all good things, it didn’t last.